It is strongly recommended that each participant consult with a physician to ensure that no health conditions exist that could interfere with the physically rigorous demands of training for the climb. For more comprehensive and individualized climb preparation training, participants should consult with Maria for a personalized program. Increasing strength of the entire body and focusing on the muscle groups used for mountaineering. Increasing cardiovascular endurance and the energy systems used for mountaineering. Increasing balance and the kinesthetic ability to move efficiently over rough terrain. Increasing mental stamina and toughness. Being in peak physical condition is the single most important aspect for climbers to maximize their climbing potential. When it comes to summit day, the stronger a climber is, the better the body will be able to handle the incredible physical demands it will face. The better the physical condition, the more likely a climber is to perform well, and have an enjoyable experience. This general plan has been designed with that in mind. Within the plan there are several important components that should be included in your climbing prep training: Cardiovascular conditioning including aerobic workouts, interval workouts, stair/hill climbing; strength training, balance and functional training, stretching and foam roller work, hiking and rest. Climbers will benefit from having strong muscles and excellent cardiovascular fitness in addition to being as close to their ideal body weight as possible. The less bodyweight, the less weight a climber has to carry up the mountain. The best way to assess this is a body fat test. I recommend my female clients have a body fat percentage of 17-24% and my male clients 12-17%. Plan out your weekly schedule based on the monthly guidelines for each component. Use the goals and work out details to schedule your weekly schedule making sure you have included all the workout elements each week. By the time you are 2 weeks from your climb date you should be able to ascend 4400 feet in 5-6 hours (including a one hour break) carrying the amount of weight that your mountain guides recommend for your climb day hike from start to basecamp. Strength training is necessary to provide the overload needed to stimulate muscle growth in your legs, core, and upper back and shoulders. This strength will make your climb feel easier, your pack more comfortable to carry and the whole experience more enjoyable. It is best to do full body workouts. Include exercises for your legs, hamstrings, glutes, low back, chest, back, shoulders, rear delts, biceps and triceps and core. Have a full day off in between your full body workouts. In general lift enough weight that you are fatigued between 10 and 15 reps. You may occasionally do a split upper body or lower body workout. Be sure to include a dynamic warm-up before weight training. In addition, include functional training to challenge balance, agility, strength and coordination to train your body to work efficiently on unstable mountainous terrain. In regards to any of your cardio workouts, in general, do not increase time or distance more than ten percent from one session to the next to avoid injury. The aerobic system is the one that you will rely on most for climbing. The aerobic system generates energy in the form of ATP in the presence of oxygen. So, in your training, for aerobic cardio sessions, keep your heart rate in the 70-80% Maximum Heart Rate (MHR) zone. Aerobic training can include running, biking, swimming, cross-country skiing, snowshoeing, stair climbing, elliptical trainer, rowing, Stairmaster, stationary bicycle, treadmill, jogging, walking, inline skating. In addition to the aerobic system, our bodies rely on two anaerobic systems to generate ATP (the energy molecule) in the absence of oxygen. Glycolysis (or lactic acid system) and the phosphagen system (also called the ATP-CP system). The phosphagen system provides energy at a rapid rate for short-term, intense activities lasting 15 seconds or less. Glycolysis is the predominant energy system used for all-out exercise lasting from 30 seconds to about 2 minutes and is the second-fastest way to resynthesize ATP. Interval train to improve the anaerobic energy systems needed for mountain climbing. Interval training involves a series of medium to high-intensity exercise bouts interspersed with lower intensity periods. The exact intervals you should do is dependent on your fitness level, the energy system you wish to train and chosen activity. Discuss an appropriate interval plan with Maria. Interval training benefits include an improved VO2 maximum (the highest amount of oxygen one can consume during exercise) and thus an improved cardiorespiratory system and a higher lactate tolerance ability which means your endurance will improve and you’ll be able to fight fatigue better so that you can work out comfortably at a more intense level. This will allow you to sustain more work over longer periods of time at lower heart rate levels. Your legs, lungs, and heart will get used to spikes in heart rate and the physical exertion needed on the mountain. In this program, it is very important that you include10 minutes of low intensity cardio (65%-80% MHR) as a warm-up prior to every interval workout. Hiking is the best and most applicable activity you can do to prepare for your climb. The hiking goals I have provided are challenging. Try to do at least one hike a month at those recommendations. If you don’t have access to hiking, consider running or walking stairs or using a stair climber. If you have a treadmill, gradually increase the incline. To prepare your body for the rigors of wearing a heavy pack during your climb, train with a pack. Recommendations are given for backpack weight and elevation gains. For those of you who are sole city-dwellers, it is possible to still get in in great shape for your mountain climb. Follow the guidelines and instead of a hike, substitute a long cardio session, perhaps of varied modes. Regularly climb stairs in a high-rise building, sign up for a couple duathons or triathlons. Or create your own once-a- week endurance workouts triathlon-style: a 400 meter swim, a 14 mile bike ride and a 3.5 mile run. Stairs/Hill Climbing is necessary to prepare your body for the rigors of performing thousands of step movements on your climb. It is best if you can do stairs. If you do not have access to stairs you can walk up a steep hill or use a stair climbing cardio machine. If you haven’t done stair workouts before, you should plan to start slowly and gradually build up your time and intensity. Make sure you warm up prior to your stair running workout. It is very important that you include 10 minutes of low intensity cardio (65%-80% MHR) as a warm-up prior to every stairs/hill climb workout. Begin by walking one step at a time. Avoid running stairs on your first few workouts. By your sixth stairs workout you can begin running, sometimes two steps at a time. Use the return to the bottom as your rest interval, and then do another set. During these workouts you will find that your heart rate tends to get elevated on the way up and decreases on the way down. Keep your heart rate less than 90% of MHR. Rest is an important aspect of mountain climbing to promote good recovery. Your rest days can include shorter, less intense version of a recreational activity or walking. A rule of thumb is to work up to peak fitness by 2-3 weeks prior to your climb and then gradually reduce your physical effort and rest more so that you are fully rested and ready for summit day. Stretch major muscle groups minimally three days a week or more often if you’d like. Target areas you know you are tight. Consider having a professional such as a physical therapist evaluate your flexibility. Do stretches when you are warm and immediately after your cardio or strength workout. Muscles are like silly putty: warm muscles stretch easily, cold muscles snap and break. Hold each stretch for a total of 60 seconds or more. And consider foam rolling. Foam rolling (also called self-myofascial release) done before your static stretching increases flexibility better than static stretching alone. Adding weight to your backpack: Guidelines used by recreational backpackers are that a person in good health should be able to carry about 20% of their body weight. More experienced backpackers should be able to carry 25% of their body weight. Very experienced and well-conditioned backpackers can carry 35% of their body weight. Start with 12-15 pounds and gradually increase the weight each time you hike. For additional weight in your pack you can carry extra water weight in your pack on the way up. One gallon of water weighs 8 pounds. If necessary, you can pour some out at the top to save your knees on the way down, though keep some for hydrating on the way down. Once you start adding significant weight to your pack, use trekking poles to aid your balance while wearing a heavy pack. Consider having a blood test to check for iron-deficiency anemia. Red blood cells store and carry oxygen through the body to our tissue and muscles, so the more red blood cells a climber has the more oxygen they have in their working muscles. The body needs iron to produce red blood cells. Iron-deficiency anemia causes a lowered red blood cell count, so people with anemia are more likely to suffer from altitude sickness and fatigue than are persons with normal blood counts. People who are diagnosed with iron deficiency anemia may want to consider taking an iron supplement before and during travel to high altitudes. Excessive amounts of Iron in the body can be harmful so if you are considering taking an iron supplement do not take an excessive amount and check with your doctor or dietitian for advice on the right dose for you. The purpose of this program is to challenge your physical stamina and strength gradually. You may find that this program is too easy. 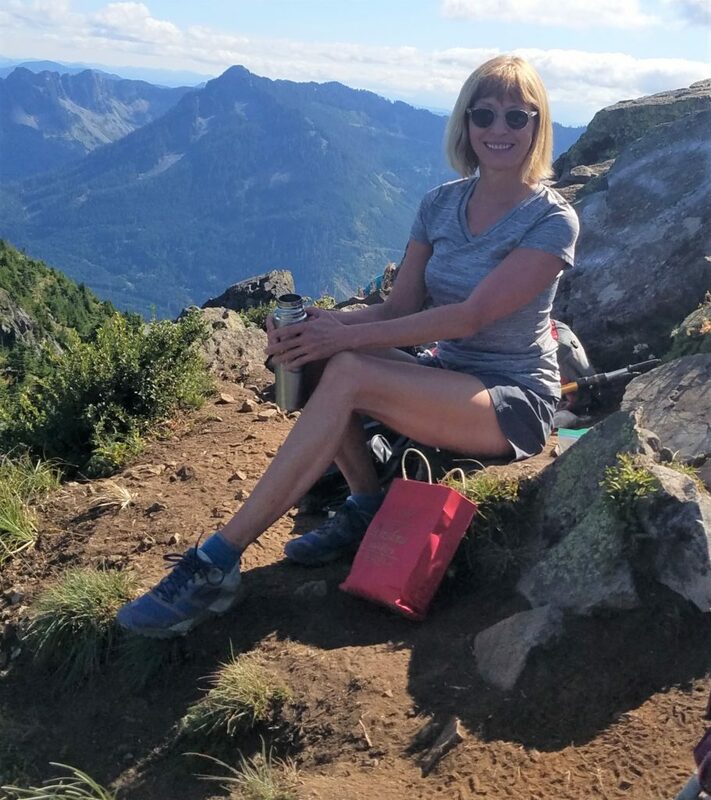 If you exercise routinely, already have some knowledge of training for hiking and have an aerobic base established already, you may need to increase the duration or modify the exercise and you might be ready for more elevation gain and the harder workouts recommended later in the program. For some of you, this program may start off too hard and so you must gradually work into the routines and increase your stamina and strength one day at a time. Listen closely to your body. The best way to train is safely, gradually, and carefully. Whatever you do, once you have made the serious commitment to this program, stick with it! And begin right away. Give yourself ample time to get ready for this mountain climb. For more comprehensive and individualized climb preparation training, participants should consult with Maria for a personalized program. 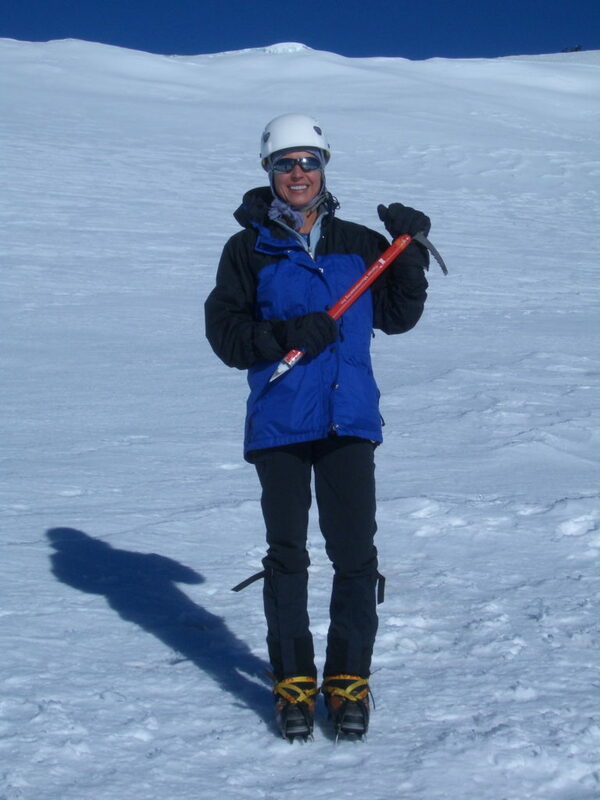 Contact Maria and you can work together to ensure you are in prime condition for your climb adventure. And don’t underestimate the importance of good nutrition. If you think your diet can be improved for optimal performance, schedule a nutrition consult. Using your climb date, decide where to start based on what training you’ve been doing already and your climb date. If your climb date is June 7, your date to start the “3 month prior” segment is March 7. If your climb date is June 20, your date to start the “4 month prior” segment would be February 20. If your climb date is July 11, your date to start the ““4 month prior” segment would be March 11. If your climb date is July 28, your date to start the “5 month prior” segment would be February 28. This plan has been designed by Mountaineering Fitness Expert Maria Faires, RD and is copyrighted. The formatting of this didn’t translate well to this blog. Contact me if you’d like me to email you the document. Stretch 2-3 days a week Aerobic training for a minimum of 30 minutes per session. Keep heart rate at 65-80% MHR. Keep track of how many minutes you do and increase 10% each workout. Rest a day in between if you can. Full body strength training. Each exercise should include 2 sets of 10–12 reps. Focus on putting together a program that works every major muscle group and learning good technique. Have your body fat checked. If it’s above my recommendations consider a healthy weight loss plan. Hike goal: 1000-1300’ elevation gain, 3-4 miles and 12-15# pack. Stretch 2-3 days a week M T W T F S S Aerobic training for a minimum of 30 and occasionally doing longer 35-45 minute sessions at 70-80% MHR. Keep track of how many minutes you do and increase 10% each workout. Add in a 20 interval program this month once a week. Include10 minutes of low intensity cardio (65%-80% MHR) as a warm-up prior to every interval workout. Full body strength training. Each exercise should include 2 sets of 10–12 reps so that muscle failure occurs on last rep. Hike goal: 1300-1600’ elevation gain, 4-5 miles and 16-20 # pack. Focus on good nutrition at meals and post workout recovery foods. Consider a good quality multivitamin/mineral with IRON supplement. Ask your doctor if additional iron is right for you. Stretch 2-3 days a week WORKOUT M T W T F S S Continue aerobic workouts but increase duration to at least 45 minutes, occasionally 45-55 minutes. On occasion, let heart rate get up to 85% MHR. Keep track of how many minutes you do and increase 10% each workout. Include hill and/or stair climbing workout at least once a week for at least 30 min. Increase your weight training sets to 3. Include two 25 minute interval training sessions. Include10 minutes of low intensity cardio (65%-80% MHR) as a warm-up prior to every interval workout. Hike goal: 1600-2000’ elevation gain, 5-6 miles and 20-25 # pack. Focus on good nutrition at meals and post workout recovery foods. Now that your hikes are getting longer plan nutritious snacks for hiking and practice good hydration. Aerobic train 2 day a week. Stretch 2-3 days a week WORKOUT M T W T F S S Do two 60 minutes aerobic sessions. Include hill and/or stair climbing workout once a week for 40 minutes. You may occasionally and gradually start running the stairs. Do two 30 minute interval training workouts. Include10 minutes of low intensity cardio (65%-80% MHR) as a warm-up prior to every interval workout. Strength train but decrease weight as needed and do 8-10 reps for 2-3 sets. Hike goal: 2000-2300’ elevation gain, 6-7 miles and 20-25 # pack. Use the pack you will be using for climb day. Stretch 2-3 days a week WORKOUT M T W T F S S Aerobic train 1 day a week 60 minute session. Strength train 2 to 3 sets of 8-10 reps. Include hill and/or stair climbing workout once a week for 45 minutes. Consider an overnight backpack trip to test your gear. Hiking goal: 2400-2800’ elevation gain, 7-9 miles with 25-30#. Use the pack you will be using for climb day. Begin purchasing and/or borrowing the gear you will need. Check the list from ALA. Stretch 2-3 days a week WORKOUT M T W T F S S Let’s build up plenty of endurance: Aerobic train 1 day a week for a 90 minute session. Do two 30 minute interval training workouts. Include10 minutes of low intensity cardio (65%-80% MHR) as a warm-up prior. Strength train but increase weight as needed and do 12-15 reps. Make sure you are doing 3 sets. Include hill and/or stair climbing workout 2 times, once at least 60 min. Hiking goal: 2800-3500’ elevation gain, 8-10 miles with 30-35#. Use the pack you will be using for climb day. Be sure to get extra sleep this month for recovery. You should have completed purchasing and/or borrowing the gear you will need. Check the list from ALA. Stretch 2-3 days a week WORKOUT M T W T F S s Purpose: Rigorous workouts will help build your mental confidence. You’ve trained hard up to this point. Keep going! Aerobic train 1 day a week for a 90 minute session. Include 3 25 minute interval training sessions. Include10 minutes of low intensity cardio (65%-80% MHR) as a warm-up prior to every interval workout. Be sure to get lots of extra sleep this month for recovery. Hiking goal: 3500-4600’ elevation gain, 8-9 miles with a 30-35# pack. Use the pack you will be using for climb day. Your last week before departing to the mountain can be a light modified routine. Cut out strength, hiking and intervals. Focus on extra rest, eating healthy foods, hydrating and packing for your trip. Pack for your trip, carefully checking the packing list form ALA.